UserVoice is a software-as-a-service product management and customer support platform that allows organizations to easily gather product feedback and deliver a great customer support experience to their users with a simple personalized interface. It provides feedback forums to understand the product ideas users care about most, a support ticket system to track and respond to customer support requests and a knowledge base to answer common questions and help users find the information they need when they need it. All these capabilities can be seamlessly integrated into your application to provide an engaging customer experience for your users. 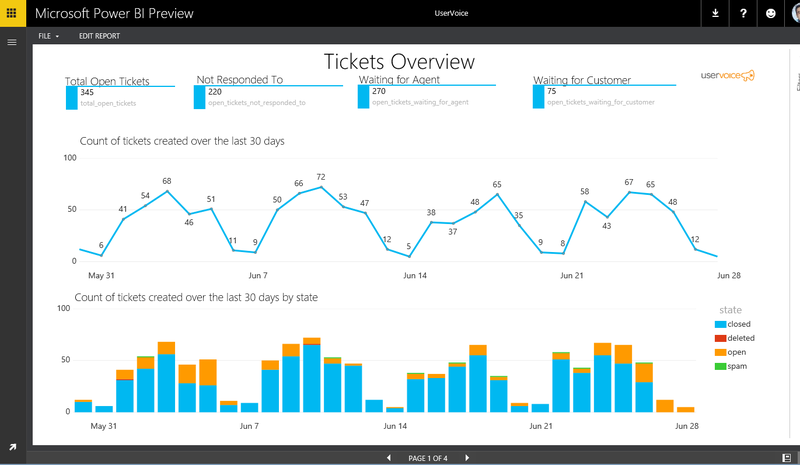 In this post we’ll talk about how the new Power BI UserVoice content pack can help you monitor and visualize your UserVoice data and immediately gain insights into it with the ready-to-use dashboard and report. To get started, choose the UserVoice entry in Power BI’s ‘Get Data’ page. Use your UserVoice credentials to connect to your UserVoice account. – A UserVoice admin account is needed to be able to successfully create the content pack. – The UserVoice URL that you need to provide has to match this pattern https://fabrikam.uservoice.com (make sure the URL is an HTTPS URL and there is no forward slash at the end). For additional details on how to get started, please see the UserVoice content pack for Power BI support page. Once connected, Power BI will bring your UserVoice data and create a ready-to-use dashboard and report that you can use right away to gain insights and explore your data. – All of your suggestions data. – All of your open tickets data as well as all tickets created in the last 30 days (even the closed ones). – All of your users’ satisfactions ratings for the past 60 days. Beside the dashboard, a four-paged report will also be created where you can further analyze and explore your data. 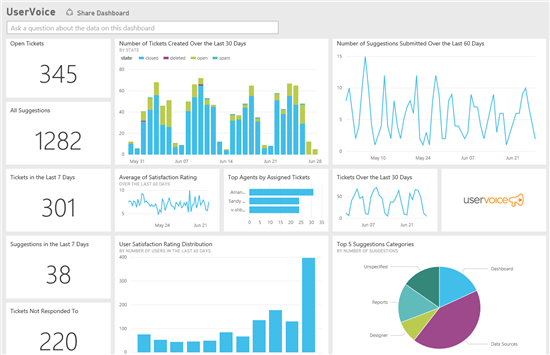 You can also create your own custom reports and dashboards using the UserVoice dataset in Power BI. Simply click on the UserVoice dataset in the datasets section, a blank report canvas will open where you can drag and drop the fields you would like to visualize. You can then save this report and pin any visuals you created to any of your dashboards. Another way to explore your UserVoice data is by using the Q&A box on your dashboard to ask natural language questions about your data. Try typing questions like “how many tickets created in the last 30 days?” or “show me the number of suggestions by status”. You can pin any Q&A visuals to your dashboards as well if you would like to keep monitoring them. The UserVoice dashboard and report updates daily so you are always monitoring your latest up-to-date data. 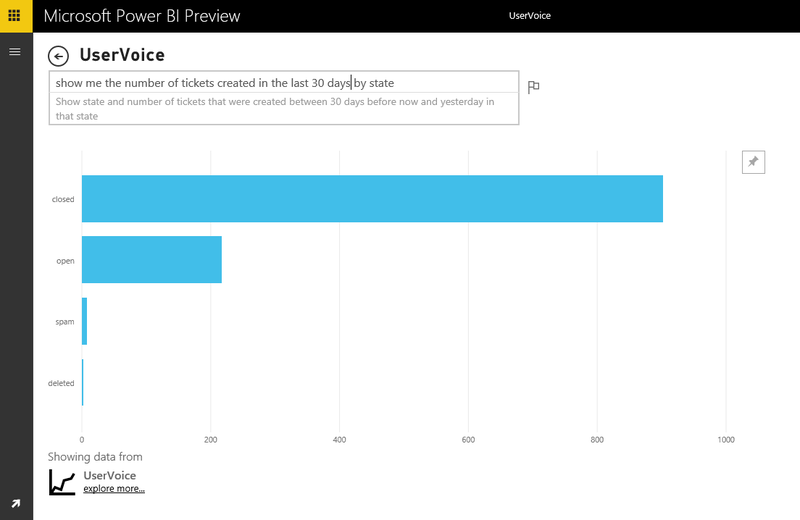 One thing to keep in mind is that Power BI uses the UserVoice APIs to connect to your UserVoice account. If you have an API usage limit on your account, make sure to keep an eye on your monthly APIs usage progress and perhaps adjust the frequency of the data refresh accordingly. For example, if you have a lot of UserVoice data in your account, this will put more load on your API usage, so you may choose to limit the data refresh to only weekdays, or to every other day. You can configure this in the ‘Schedule Refresh’ option on the UserVoice dataset. Another way of minimizing the impact on your APIs limit is to have one of your UserVoice’s account admins create the content pack and share the dashboard with the rest of the team instead of having every admin create their own content pack.